Sir James Dromgole Linton (26 December 1840, St Pancras, London – 3 October 1916, Hampstead, London) was an English painter in oil and watercolour and a lithographer. He was knighted in 1885. Linton was educated at Leigh's School of Art. At the beginning of his career he was an illustrator and lithographer for The Graphic. 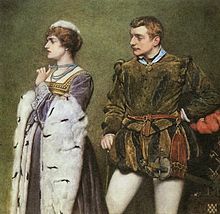 One of his most famous paintings is "The Marriage of H.R.H. the Duke of Albany," which was done in oil in 1885 at the command of Queen Victoria. (The marriage depicted is that of Prince Leopold, Duke of Albany in 1882.) Charles T. Jacoby, brother of Sir James Alfred Jacoby, commissioned a series of five oil paintings illustrating the 'History of a Soldier of the Sixteenth Century' with the titles "The Declaration of War," "The Benediction," "The Surrender," "Victorious," and "The Banquet." Linton was elected an associate in 1867 and a member in 1870 of the Royal Institute of Painters in Water Colours. He was president of the Royal Institute from 1884 to 1899 and then from 1909 until his death. In 1897 he won the Jubilee Medal. James Walter Robert (1869–1947). J.W.R. Linton attended the Slade School of Fine Art in London and founded in 1899–1901 the Linton School of Art in Perth, Australia. Violet Harriet (1874–1955). V.H. Linton gained a considerable reputation as a miniaturist and in 1910 married Thomas John Cheater (ca. 1863–1956). ^ Stephens, F. G. (1893). "The Portfolio: An Artistic Periodical". 24: 224–231. ^ "Linton, Sir James Dromgole". Who's Who. Vol. 59. 1907. p. 1063. ^ Ward, Thomas Humphry (ed.). "Linton, Sir James D.". Men of the Time. pp. 652–653. ^ "Sir James Linton". The Album Supplement. April 29, 1895. Wikimedia Commons has media related to James Dromgole Linton.